Cassia Oil - Traditional (China) - Ultra International B.V.Ultra International B.V.
Cassia Oil is steam distilled from the leaves of Cinnamomum Cassia, large slender trees which grow in southeastern parts of China and Burma and is commonly known as Chinese Cinnamon. Its bark is actually used to flavour food and beverages, just like original Cinnamon. The essential oil of Cassia is derived by steam distillation of its leaves and twigs. As an aromatherapy product Cassia has it seems endless uses, especially related to stomach and digestives systems. Benefits include Anti-emetic, Anti-galactogogue, Anti-Rheumatic & Anti Arthritic, Antimicrobial, Astringent, Circulatory, Antiviral, Emmenagogue, Stimulant, Carminative and Febrifuge (to name a few!). Chinese exports have been stable over recent years as to have been prices until recently. During 2015 prices have softened due to a lack of demand from the market. This may be short lived as at lower prices farmers won't produce which will in turn limits supplies to the market ensuring prices remain stable. Cassia is not faring too well in terms of demand, so it is a tad challenging to predict prices for 2019. It still remains unique and a class apart from the other Chinese essential oils so prices will not have too big a plunge in 2019. January saw prices dipping. It is nearing season’s end and output too is gradually dwindling. During the Chinese New Year holiday, domestic logistics players ceased their operations. Factories stopped processing, thereby limiting inventories, though it did not significantly affect prices. Considering some factories are still in the process of accumulating raw materials to fulfill orders, logistics could not be effectively undertaken and there continued to be a dearth of oil; price appreciation is but natural. Between 2012 and 2017 Chinese annual cassia oil exports showed a continuous downward trend falling from 526 MT per year to 280 MT. 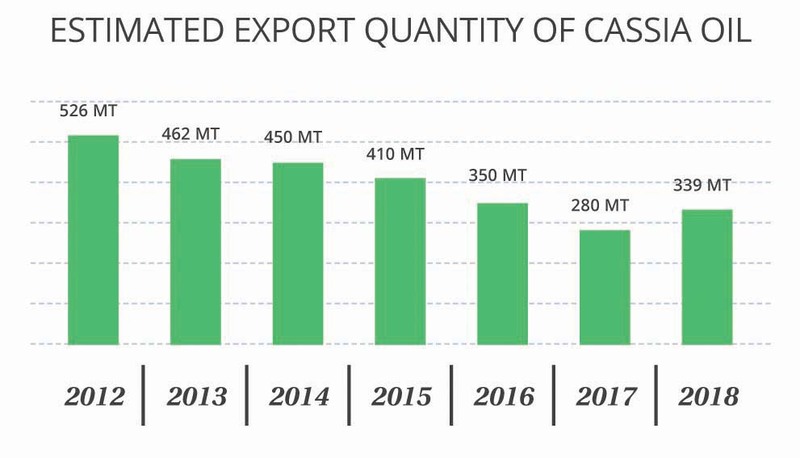 However, in 2018 estimated cassia oil exports rose to 339 MT.